Re-live and share the unique Spirograph drawing experience with the Original Spirograph Deluxe Set. Your eyes won’t believe what your hands have drawn by simply rotating the wheels around the Spirograph Rings. 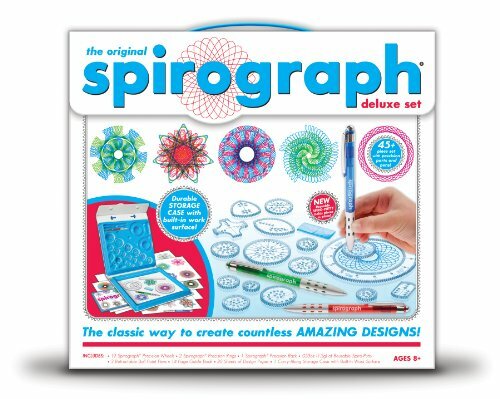 This classic toy features new updates designed to improve the Spirograph drawing experience, while staying true to the original. The classic way for aspiring artists to create millions of amazing designs is back and better than ever. The Spirograph Deluxe Set features the all-new Spiro-Putty, which holds the pieces securely in place without putting holes in your paper. 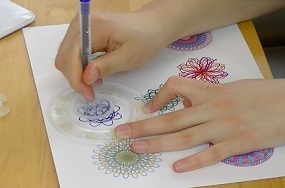 Simply press a few pieces of Spiro-putty to the underside of a Spirograph gear and press onto any drawing surface. Spiro-putty lets you create amazing Spirograph designs on all kinds of things like greeting cards, envelopes, gift tags and more! The 22 precision-engineered gears included in the Spirograph Deluxe Set have been updated to work with a variety of different drawing instruments so you can now create amazing Spirograph art using most sizes of markers, pens, and pencils. The Deluxe Set comes with 3 high quality, retractable ballpoint pens with vibrant-color ink. The smooth drawing tips ensure a clean and consistent line so that your intricate Spirograph designs always look amazing. The Spirograph Deluxe Set doubles as a high-quality carry-along storage case with a built-in work surface. Just snap all of the pieces into place and your can take your Spirograph with you wherever you go. Learn all of the basic principles of drawing with Spirograph with the included design guide book. This 14-page guide is loaded with helpful techniques, tips and tricks and full-color instructions for creating incredible Spirograph designs. Follow the steps in the guide to draw the provided designs or use what you have learned to create your own one-of-a-kind piece of spiro-art. 22 precision-engineered gears work with a variety of different drawing instruments.